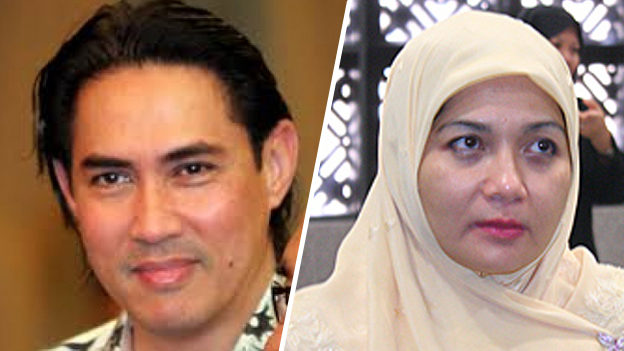 The heavily contentious multi-million Ringgit divorce demands by Shahnaz Abdul Majid against her former husband Sarawak business entrepreneur Datuk Seri Mahmud Abu Bekir Taib, was heard today at the Kuala Lumpur Shariah Appeals Court with three appeal proceedings filed to be adjudicated by the highest court in the Shariah judicial system. At earlier Shariah High Court hearings, Shahnaz had demanded a cumulative set of claims in excess of over half a billion Ringgit. Mahmud is defending this vigorously as such quantums have never been set as precedents in the Shariah courts. Shahnaz had sought for the discovery of the assets of Mahmud for her RM300 million matrimonial assets division claim. She had also claimed in excess of RM121 million for child maintenance for their son Raden Murya Abdul Taib Mahmud to include a terrace house in London (RM60 million), a residence in Bukit Tunku (RM10 million), two Aston Martins (RM5.5 million), medical insurance (RM5 million) and a private trust fund (RM40 million) to be held and managed by her. In addition, Shahnaz had also claimed RM100 million for ‘mutaah’ (conciliatory gift). Nevertheless, her exparte application for the discovery of the assets of Mahmud to support her claims was objected and subsequently struck off by the Shariah High Court on the grounds that the plaintiff had filed her application under the wrong provision of Section 229 of the Shariah Court Civil Procedure (FT) Act 1988 (Act 585). Shahnaz was initially granted an order for discovery on 9 May 2011. However, it was overturned by the same court on 6 March 2013 on that account and to her dismay. At the Kuala Lumpur Shariah Appeals Court today, Shahnaz therefore sought to appeal to overturn the Shariah High court decision on the discovery of assets. The appeals were heard before Chief Shariah High Court Judge of Wilayah Persekutuan Datuk Mahammad bin Ibrahim; Chief Shariah High Court Judge of Perak Datuk Muhamad Asri bin Abdullah and Shariah High Court Appeals Judge Datuk Yusof bin Musa. It was argued by the defendant that Shahnaz should have filed her application under the specific provision of Section 151 (1) (aa) of the same Act. Section 229 clearly states that it can only be invoked exclusively by the court and not by the litigants. Hence, 151 (1) (aa) should have been taken by any party or interested parties to invoke the committal proceedings contended. The Shahriah appeals court judges have reserved their decision to 18 June 2015. Meanwhile, Mahmud had also applied to have Shahnaz’s RM121 million child maintenance claim struck out on the grounds that their son had under the provisions of the Age of Majority Act, 1971, reached the age of 18 and in full capacity to be an independent litigant as a major. As such, Mahmud contended that Shahnaz had no capacity to initiate multi-millon Ringgit suits against him on behalf of Raden. Unfortunately the application could not he heard today as the plaintiff’s lawyers would require some two hours to argue the case. The matter will now be heard by the Shariah appeals court on 14 July 2015. Mahmud has also applied to rectify the intitulement of the said appeal to correct his application from ‘Selangor’ to ‘Wilayah Persekutuan’ which will be heard on 9 July 2015. Raden, born on 11 December 1993, would today be 21 years 5 months old and no longer a minor to be managed by his mother. In earlier hearings at the Kuala Lumpur Shahriah High Court, Mahmud testified that Shahnaz had engaged a pair of Canadian fraudsters Cullen Johnson and Elaine White to support her excessive claims. Shahnaz testified in her ‘mutaah’ hearing that Mahmud had off shore wealth in excess of USD700 million in Canada, the US, the Caribbean, France, Luxembourg, Monaco, Hong Kong and Switzerland.